(1935, Supreme) Johnny Mack Brown, Karl Hackett, Sheila Mannors. A fine Forgotten Horrors western. 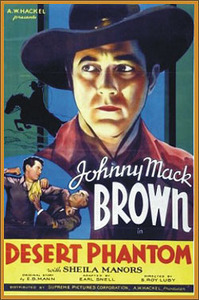 Brown comes to a mysterious ranch were a phantom killer is on the loose. The ranch is owned by a helpless cripple and a young girl. JM trails the killer to a secret mineshaft where he nearly plunges to his death! Lots of dark, creepy scenes. 16mm.